Click "You" in the top right corner of your page on GiveGab to expand your Top Navigation bar. From the top left corner of your Top Navigation dropdown menu, click "Log Hours" to enter into your volunteer hour information. 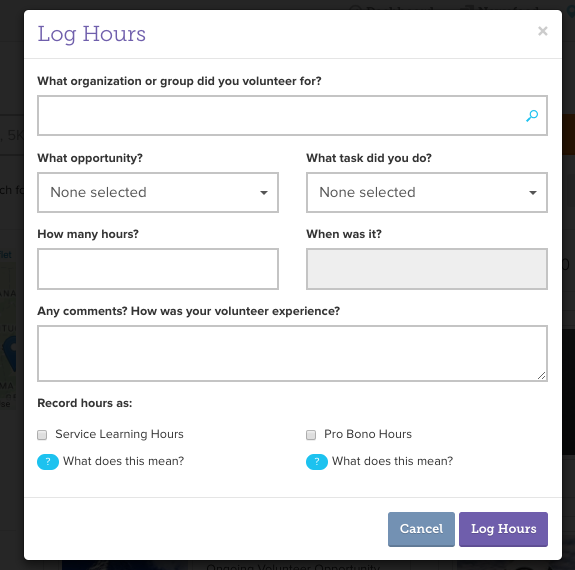 Once you click "Log Hours" this form will appear where you can enter the details of your volunteer experience. Volunteer Organization: From the list of active organizations on GiveGab, select the organization you volunteered with. If the organization you volunteered with is not on GiveGab, you can select "GiveGab Givers" as the organization name. Volunteer Opportunity: If you volunteered for a specific opportunity on GiveGab, select that opportunity from the drop down menu. Volunteer Task: If you signed up for a specific task during the opportunity, select that task from the drop down menu. Volunteer Hours: Here you can add the amount of hours you volunteered for this organization. Opportunity Date: If you didn't select a specific opportunity, enter the date that you volunteered for this organization. Count as Service Learning Hours: Check this box if your hours are required for a service learning opportunity. Once you've filled out this form, click "Log Hours" to have them reflected on your impact page and count towards that organization's total hours logged.